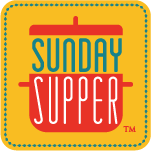 Yay, we’re back for another Sunday Supper! This week is Super Eats For Game Day! Makes perfect sense since today is the day when many will gather to watch the Big Game that they’ve been waiting weeks for! In our family our boys enjoy pro football but my husband prefers college football. What we can all agree on is that we love having an excuse to gather and share great food! 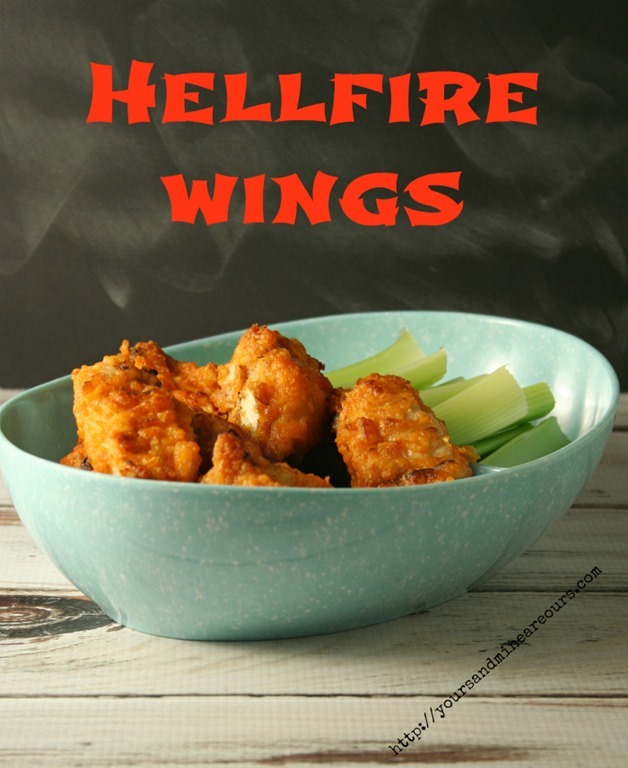 If you have been here before you know that we love spicy so this year my husband came up with a Hellfire Wings recipe that’s sure to be a favorite. These wings have a heat that sticks with you for a little bit but not the kind of heat that makes you feel like your tongue is numb! They’re baked and not fried which is a huge plus. I don’t necessarily have anything against frying other than it takes so long to do large batches of anything and I don’t really love the smell of the grease. This is not a saucy wing so it’s not as messy as some would be which is nice when you’re having a big crowd over and are not all sitting at the table. You can set aside sauce from the recipe to serve with them for dipping or use any of your favorite dipping sauces but they’re delicious as is. So, do you and your family watch the Super Bowl, get together just for the food or skip the whole thing? Mix flour and spices in a large bowl (an ice cream bucket with lid works well for this). 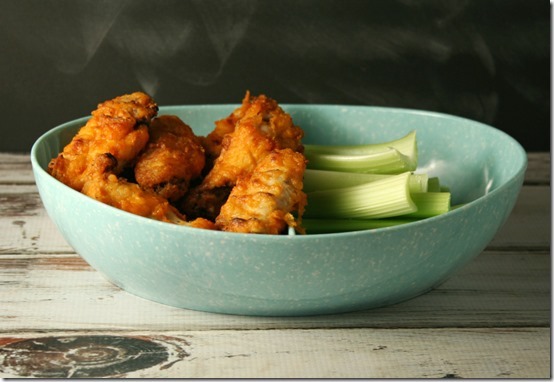 Drop the wings into the bowl, put the lid on and shake to coat all wings. Place the wings on an ungreased cookie sheet and put into the refrigerator for about one hour to help set the flour mixture. Mix butter, hot sauce and ghost pepper hot sauce in a bowl. Carefully coat the wings in the hot sauce making sure not to pull the flour mixture off. Place the wings in a single layer on a baking pan with rack in place. If you do not have one of these types of pans you can use cookie racks placed on a rimmed baking sheet. Make sure you spray the racks with cooking spray so that the wings do not stick. Bake for 25 minutes in a preheated 400 degree oven. Turn and bake for an additional 25 minutes. Turn your broiler on and broil for 16 minutes total – in 4 minute intervals and turning at each interval. So, broil for 4 minutes then turn, broil for 4 more minutes and turn and so forth. That’s it they’re ready to serve! I had heard of ghost peppers but never knew this sauce existed until my husband came home with it. If your brother tries them let me know how he likes them. Yes, please! I love a nice, spicy chicken wing! Your pictures are mouthwatering! Thank you for the great compliment, Jennifer! oh my gawd, I have never heard of ghost pepper hot sauce but I think I need to try it! These wings look great!!!! I hadn't either, Alice! It really is very good and not the type of heat I expected. Of course we didn't use a crazy amount either so that makes a difference I'm sure. Are you kidding? Living in Denver and being an avid/rabid Bronco fan, you bet we'll be glued to that television. 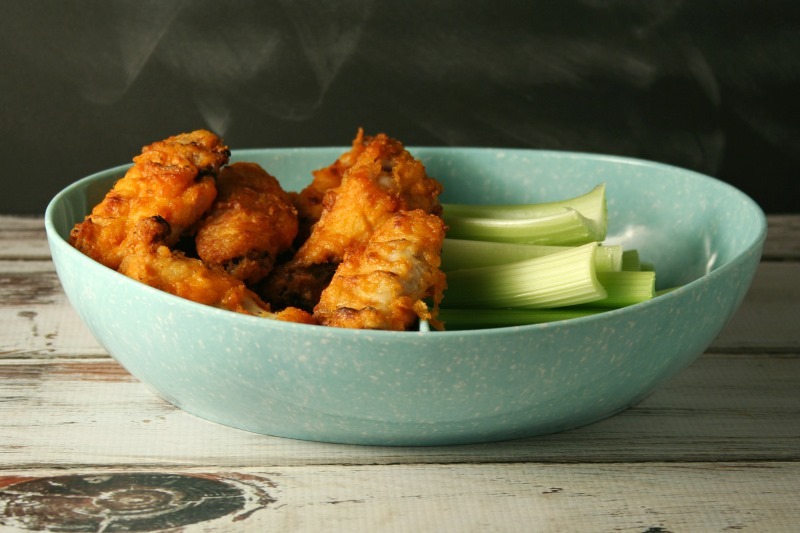 Wings are such a great game day choice. And I hate it when they're so hot that my tongue is numb. :) These sound just right. Thanks for sharing a great recipe. Oh I bet it's going to be fun at your house tonight, Lea Ann! Enjoy the game! When my husband came home I was a nervous wreck! The Dave's Insanity Sauce is hot already so I was sure this was going to be intolerable. I was so surprised that it was hot without that miserable burn left behind. Thank you, Stacy! My husband and I are the same way with spicy food. You have know idea how bad I want to try these wings! I love the name of them too!! I am actually wiping drool from the corner of my mouth thinking of them. Awesome recipe!! Thank you, Jennifer! What a great compliment. We love spicy food, and this would be perfect!! 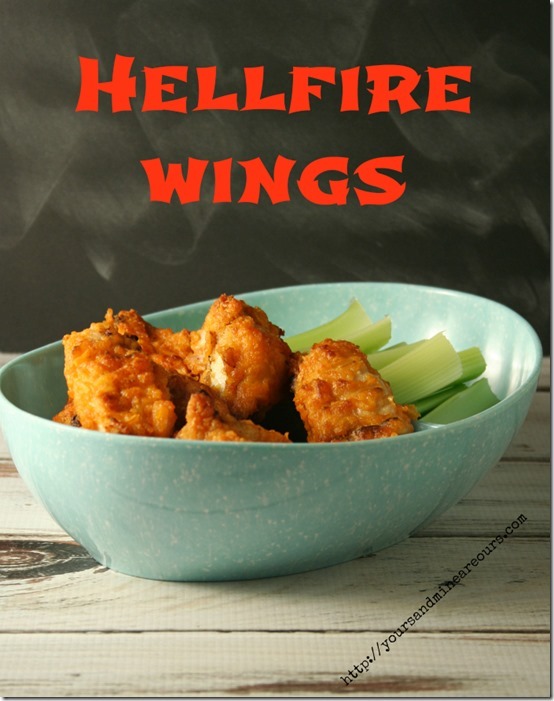 I love all these wings recipes we're seeing today on #SS!! My husband watches the games and sometimes I keep him company, but I'm usually on the computer too so that I don't have to just sit there and watch the game. That would drive me insane by the 4th quarter. Baked and with heat? The perfect combination!! Thank you, Betsy. We used to use a fryer often but about a year ago we got rid of it. I really can't handle fried like I used to but we do still love the heat. I hope he loves them as much as we do! While in Canada once I had a Hellfire Bruschetta Chicken and it was amazing. Since then I've also had Hellfire Chili. We love heat as well and I just love that name. Thank you, Renee! I agree on the frying and it takes so much longer than baking. My husband loves ghost pepper sauce! He would be all over these! Hope you get to try them sometime. I was so afraid of the ghost pepper sauce when my husband brought it home but so glad we tried it. It really is a different kind of heat than habanero. My sister would love this. But me I can't handle anything hot. Our daughter couldn't eat spicy food for the longest time but just this past year started loving it. Anything that sates that it's "hellfire" in heat has got me hooked! I'd even eat these wings for breakfast! Thanks for stopping by my blog too and leaving your kind comment! We are the same way Roz! Love love spicy. Thanks so much for stopping by!